For other uses, see Brough. 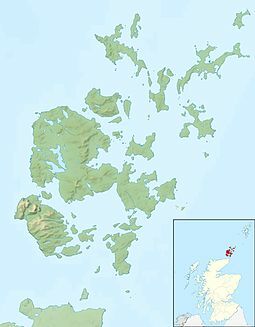 The Brough of Birsay is an uninhabited tidal island off the north-west coast of The Mainland of Orkney, Scotland, in the parish of Birsay. It is located around 13 miles north of Stromness and features the remains of Pictish and Norse settlements as well as a modern light house. The island is accessible on foot at low tide via a largely natural causeway. It is separated from the mainland by a 240-metre (790-foot) stretch of water at high tide: the Sound of Birsay. The Norse settlement has been partly removed by coastal erosion, and the cliffs are reinforced by concrete rip-rap to prevent further damage. The Old Norse name for the island was "Byrgisey" which means fort island, and gives the parish its name. Brough, indeed, means fort (for etymology, see broch). The church has an interesting shape; probably with a square tower at one end, and a semi-circular apse at the other. There is some evidence of an earlier, possibly Pictish church on the same site. The church was a place of pilgrimage until the Middle Ages. The remains of adjoining buildings round three sides of an open court suggest that it may once have been a small monastery (though there is no documentation for such a foundation). There were also a number of Norse dwellings, some of them of considerable size indicating substantial wealth. They included long houses, featuring both heating and drainage systems and some indications that saunas were present. Although not all the houses were likely in use at the same time, there was a significant community living here. :58 The site, and particularly the objects found there, have been central to debates about the nature of Pictish-Norse relations in Northern Scotland. The site is in the care of Historic Scotland. The unmanned Brough of Birsay Lighthouse lighthouse is on the Brough. Sea bird breeding colonies can be found on the brough. ^ Rick Livingstone’s Tables of the Islands of Scotland (pdf) Argyll Yacht Charters. Retrieved 12 Dec 2011. ^ Haswell-Smith, Hamish (2004). The Scottish Islands. Edinburgh: Canongate. ISBN 978-1-84195-454-7. ^ Ordnance Survey. OS Maps Online (Map). 1:25,000. Leisure. ^ Orkneyjar: Ancient seat of Orkney power. Retrieved 1 August 2007. ^ a b c d e f Wickham-Jones, Caroline (2012). Monuments of Orkney. Historic Scotland. ISBN 978-1-84917-073-4. ^ "Brough of Birsay Lighthouse". Northern Lighthouse Board. Retrieved 5 March 2010. Wikimedia Commons has media related to Brough of Birsay. Historic Environment Scotland. "Brough of Birsay, settlements, church and related remains (SM90034)". This page was last edited on 13 March 2019, at 17:44 (UTC).